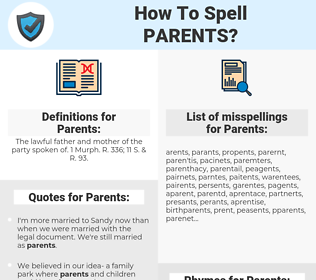 What are the misspellings for Parents? What are the common mistypes for Parents? What is the definition of Parents? What are the usage examples for Parents? What are the quotes for Parents? What are the rhymes for Parents? What are the translations for Parents? 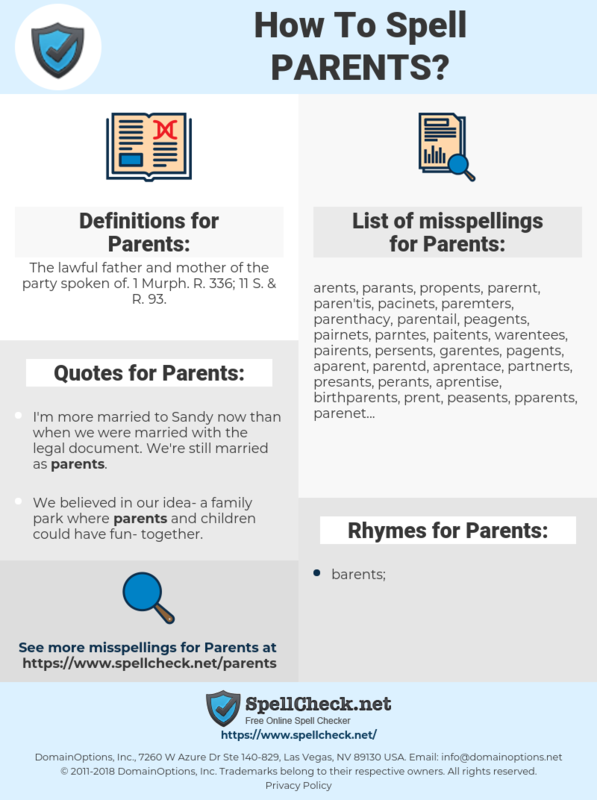 What are the common typos for Parents? The lawful father and mother of the party spoken of. 1 Murph. R. 336; 11 S. & R. 93. This graph shows how "Parents" have occurred between 1800 and 2008 in a corpus of English books. I'm more married to Sandy now than when we were married with the legal document. We're still married as parents. We believed in our idea- a family park where parents and children could have fun- together. When I was a child in the 1940s and early 1950s, my parents and grandparents spoke of Britain as home, and New Zealand had this strong sense of identity and coherence as being part of the commonwealth and a the identity of its people as being British. I get bitter, angry and disbelieving and I tell my kids there a lot of idiots out there. I also want them to know that being successful is not the real world- that their parents get treated better because they're on TV.